There are several reasons residents and visitors enjoy the scenic areas in Redlands, CA. Whether it is cruising in convertibles on windy roads or taking speedboats out on the gorgeous lake, there are plenty of things to do. Many of these activities involve seasonal vehicles such as motorcycles or RVs. When the vehicles are not in use, Vines Storage provides them a safe and secure home away from home. Seasonal vehicles are only used a few months of the year. Motorcycles, mopeds, off-road vehicles, ATVs, snowmobiles, and classic cars fall in the category of seasonal vehicles. Some people build storage sheds for larger vehicles or park them in their driveways. However, many cities in the Redlands area prohibit parking RVs and storing boats in neighborhoods. Regardless of the type of car or vehicle, we can provide the ideal space. We provide a climate-controlled indoor facility for the most valuable classic cars. We know our customers have invested a lot of time and money into the vehicles and want the best for them. At Vines Storage, they can store classic cars in our indoor stalls or self-storage units. Either way, they can count on around-the-clock security, thanks to our 32-camera video surveillance system. Additionally, our facility is only accessible with a key code at our gated entrance and our staff is on site seven days a week from morning until evening. 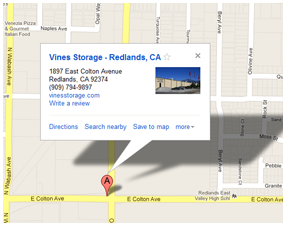 Our customers enjoy convenience at Vines Storage. They can drive their RVs into the indoor facility and park it. When they are ready to take the RVs on the road for family vacations, they return, rev up the engines, and hit the road. They can also store their boats indoors or outdoors, depending on their needs and preferences. When they are ready to take their boats on the lake, they simply latch them up and drive away. We also provide various amenities such as purified water and ice, appreciated by our customers before they hit the road. Are you looking for a storage facility for your seasonal vehicle? We would be happy to talk with you about all of your options. Call 909-389-6209 today.